Sustainable safe blood supply is of utmost importance in a health care system. In Hong Kong, blood donation is administered by the Hong Kong Red Cross Blood Transfusion Service, operative under the Hospital Authority. There are 7 blood donor centres, 5 of which are open on both weekdays as well as weekends and Sundays. The map shows the residence locations by District Council Constituency Area (DCCA) of 415 donors giving blood on a Sunday. 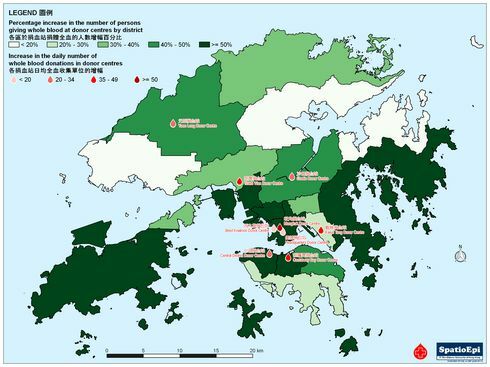 While most of the donors were living in the vicinity of the Shatin and Tsuen Wan donor centre, a highest proportion (35%) gave blood at the Mongkok donor centre.